As an extension of the work of this website we have recently started to publish a number of our own printed books which set forth the Gospel of Christ. These are made available to both those who have no online access and to those who would prefer to read on the printed page, rather than on a computer screen. "Grace and Truth Online Publications" is entirely non-profit making and in fact runs at a loss. In producing such works it is our desire to see the work of God furthered in the proclamation of His Gospel, and to provide encouragement and consolation to God's people in a needy day. But most of all we wish to see God's Name glorified and honoured. Below are details of our current publications along with full ordering information. WHAT is the Gospel of God? This is the question which this new title sets out to answer, by considering that gospel as declared in Paul�s Epistle to the Romans. The gospel is an objective, definitive message setting forth the Person and the Work of Christ. It encompasses all God's truth regarding Him and His salvation. It is the message of God's word, the Bible. It concerns God and man, good and evil, life and death, time and eternity, heaven and hell. Is any question more important than how we stand in relation to the Gospel of Christ? How is it with your soul? Is Christ � the Son of God � your Saviour? Do you love His gospel, His message of salvation? Paul says of that gospel in Romans 1:16: "I am not ashamed of the gospel of Christ: for it is the power of God unto salvation to every one that believeth". Yet to the natural man the gospel is offensive. 1 Corinthians 1 clearly tells us that. But it is also man's greatest need � he is lost in sin and needs a Saviour. How vital in this day is the preaching of this message. To that end, the intent of this book is to present truth from the Gospel of God in its various parts, and the sum of those parts, as found in the Epistle to the Romans. It does not seek to be a verse-by-verse commentary, but rather to consider the vital aspects of the truth as set forth in this, surely one of the most glorious of all epistles. For more details and/or to order the book online view the book description on Lulu.com or visit our Publications Booklist or contact the Christian Bookshop Ossett for U.K. orders. We are pleased to announce the publication of our third title, "Sovereign Grace - Past and Present", a collection of writings from both past and present preachers of God's Gospel of Free and Sovereign Grace through Jesus Christ. Includes works by William Tiptaft, Tobias Crisp, William Huntington, William Gadsby, Robert Murray M'Cheyne, J.C. Philpot, John Kershaw, James Bourne, Eli Ashdown, Francis Covell, John Vinall, John Warburton, Don Fortner, Henry Mahan, Don Bell, Gary Shepard, Todd Nibert, Tom Harding, Peter Meney and Benjamin A. Ramsbottom. Click here for full contents list. The book also includes an Introduction on 'Sovereign Grace', background information about each author and a useful appendix containing much information about other works written by or about the authors. These works are by authors whose lives span several hundred years, yet their message is the same - they proclaim the grace of God which brings salvation - because the One of whom they speak never changes, He is "Jesus Christ, the same yesterday, and to day, and for ever". (Available in the United Kingdom from the Christian Bookshop Ossett [21 Queen Street, Ossett, West Yorks, WF5 8AS Tel. 01924 260502] for �10.50 plus post and packaging, OR in the U.S.A. and elsewhere for $16.99 plus post and packaging from Lulu.com which is the company which prints the books for us. "The Dimensions of Eternal Love"
"The Destruction of Death by the Fountain of Life"
"The Eternal Setting of the Sun"
"The Saint�s Seed-time and Harvest"
"An Innocent Game for Babes in Grace"
"The Broken Cistern & The Springing Well"
The book also includes biographical material about Huntington and his ministry written by Dr. George M. Ella, as well as a useful bibliography of available books by or about William Huntington. We trust that this publication will prove edifying to readers and also provide a welcome introduction to the writings of Huntington to those who may be unfamiliar with the works of this man who was greatly used by God in his day and generation. (Available in the United Kingdom from the Christian Bookshop Ossett [21 Queen Street, Ossett, West Yorks, WF5 8AS Tel. 01924 260502] for �6.95 plus post and packaging, OR in the U.S.A. and elsewhere for $10.99 plus post and packaging from Lulu.com which is the company which prints the books for us. This is the first of our own publications to be published and contains a number of chapters based on articles originally published on this website. A couple of the articles have also appeared in print in the pages of �New Focus� magazine. The book sets forth pictures of Christ as He is revealed throughout the scriptures. The whole message of the Bible regards the person and the work of Jesus Christ, the eternal Son of God. He is to be found on every page of Holy Writ. He is the sum and substance of God�s message to lost mankind, He is the One through whom God reveals Himself to man, He is the One through whom God reconciles sinners to Himself, He is the One in whom all the blessings of God to His people are revealed. Christ is all and in all. Yes, the Gospel of God concerns His Son, Jesus Christ and the message of the Bible is one of the Salvation of sinners through Christ, by Free and Sovereign Grace. Christ Himself is God�s message to man, so when we read the scriptures we look for Him. The following books are published by The Huntingtonian Press which publishes a number of books and booklets by writers including William Huntington and others who preached the same Gospel of Free and Sovereign Grace (including J.C. Philpot, Robert Hawker, Joseph Irons and William Gadsby). Their publications are highly recommended, along with their occasional magazine called "The Sinner Saved". Full details of the magazine and a current booklist can be obtained by writing to The Huntingtonian Press, 72a Upper Northam Road, Hedge End, Southampton, England, SO30 4EB. Just before the Victorian era began in England, Bernard Gilpin was led to understand, and to teach, that real communion with God is obtained through "patient waiting" which "is really identical with the way of tribulation." He was made a faithful and effectual minister of the gospel. The church which gathered under his ministry knew all the hardships associated with living in the 19th century but could testify that God always sustained them, and sometimes visited them with "a near view of Christ and his spiritual presence." "Although describing the lives and experiences of 19th century saints, this is very much a book for today. As the preacher says: "There is no new thing under the sun" (Ecclesiastes 1:9); and the need to emphasise the worthlessness of mere notional religion is just as vital in our day and generation. The book provides a good antidote to the present craze for the 'excitement' of hyper-scriptural experiences or, at the other extreme, mere academic knowledge and even honours. The rush for ministers to obtain worldly honours, 'doctorates' etc. is incredible in the light of our Lord's warnings not to delight in being called by various titles, and the Spirit's teaching in 1 Corinthians. Bernard Gilpin renounced any such claims to seek and find the teaching of the Lord, and the Lord blessed him, and his hearers through his ministry. The numbers attending that ministry were never great by the world's standards, and he and his church knew disappointments, but it is clear that a spiritual and highly favoured flock were gathered together by the great Shepherd of the sheep, which were for the most part united and had a great care and concern for one another's welfare; and who grew together in grace and in the knowledge of the Lord Jesus Christ." During J.C. Philpot's editorship of the Gospel Standard Magazine, he wrote a number of very perceptive book reviews. These were collected and published after his death in two volumes under the title Reviews by the Late Mr J C Philpot, MA. These volumes were last published by Messrs Frederick Kirby in 1901, and have remained out of print since that time. Following the success of the volume Singing and Making Melody the directors of the Huntingtonian Press have decided to embark upon the project of re-issuing the whole of these reviews. They will be collected together under various headings, the first of which is THE HUNTINGTONIANS. The volume comprises four sections: Section One brings together Philpot's Reviews of books by and about William Huntington. Section Two, his immediate circle of friends. Section Three, others whose lives were touched by Huntington's ministry. And the final section brings together Philpot's reviews of books about James Bourne's and Bernard Gilpin's people. The Huntingtonians by J.C. Philpot comprises approx. 250 pages and is case bound. Justification by faith is a doctrine which is foundational to the truth of the Gospel, for salvation depends upon man being declared just before God. Yet man by nature is dead in trespasses and sins, and when brought to see this by having his eyes opened by the Holy Spirit he can only cry out with Job of old, "How should man be just with God?" Job 9:2. This book shows us how. It expounds the work of God in sending His own Son to die in the place of sinners, taking their own sins upon Himself in death, shedding his blood to wash them from their sins, and accounting to them the righteousness of God by faith of Jesus Christ. 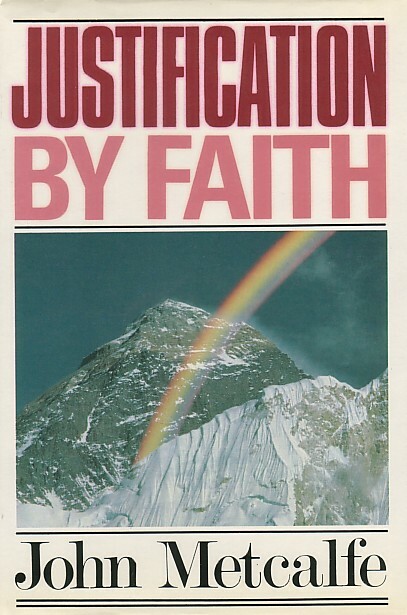 John Metcalfe's work on Justification, the sixth volume in his 'Apostolic Foundation of the Christian Church' series is easily the best work I have come across on this vital subject. Whilst many would turn to Owen or Gill on the subject, I would encourage the reader to consult this work for its faithfulness to scripture, its right dividing of the truth, its insight and clarity. Not only does Metcalfe rightly distinguish between the righteousness of the law and the righteousness of God revealed in the Gospel, but he also sets forth the correct understanding of justifying righteousness and how it was wrought - not by the law of Moses, but by the faith of Jesus Christ and by His blood shed in the place of His people. This work is highly recommended along with the companion volume "Christ Crucified" for a right understanding of the work of Christ at the cross. The eighth chapter is also available in tract form as "Justifying Righteousness: Was it wrought by the law of Moses or by the blood of Christ?" The Bible clearly teaches that Christ came to save sinners (1 Timothy 1:15), that He laid down His life for His sheep (John 10:15), that at the cross He bore THEIR sins in His own body on the tree (1 Peter 2:24). This teaching regarding the substitutionary work of Christ in giving His life for the Church, in paying their debts as sinners, in standing in their place under the outpouring of God's wrath against their sins is known as "Particular Redemption". This work by William Rushton was originally published in 1831 and was written as a defence of this Biblical teaching of particular redemption against the subtle opposition of the teachings of Andrew Fuller which sought to undermine such truth in veiled and confusing language. The book includes an Introductory Essay entitled "An Overview of the Destructive Progress of Fullerism" by Dr George M Ella. Fuller's ideas are often summarised by saying that Christ's death is "sufficient for all, but efficient to those who believe". Such an idea allows its adopters to present the gospel in such a way that it appears attractive to all by stating that Christ died for all. But the Bible plainly teaches that God saves all whom He wills, Christ's death being effectual to all those for whom He died. Essentially Fuller's teaching removes the 'offense of the cross' because the particular nature of Christ's work upon the cross is removed. Yet it is the particular, effectual, distinguishing, nature of God's grace in saving all those whom the Father gave to the Son from all eternity - and only those - which gives the preaching of the cross such power in the salvation of sinners. We highly recommend the purchase and reading of this work which is particulary relevant in our day when many seem to have been taken in by Fuller's errors and confusion regarding Christ's work upon the cross. "When Rushton first addressed the errors of Fullerism he did so by exposing its faulty view of Christ's atoning work. By reprinting Particular Redemption, we hope to show free grace believers where the central error of this teaching lies and how best to answer its modern advocates." Salvation from The Wrath to Come. I highly recommend obtaining this edifying new addition to John Metcalfe's "Apostolic Foundation of the Christian Church" series, of which this is volume X. See SALVATION by John Metcalfe : A Review Article for a fuller review. This commentary on Galatians, part of the "Welwyn Commentary" series, rightly draws out the differences between Law and Grace and shows forth the work of the Spirit in the life of the believer. Simple to read and Christ-exalting, this is highly recommended. This easy-to-read paperback draws out the powerful Gospel message from the account of Noah, the preacher of righteousness, and the ark which he built under God's direction and in which he and his family were saved from the mighty out-pouring of God's justice upon the wickedness of man. The message is clear and up-to-date: warning man about the judgment to come and his need for deliverance, a covering for sins and a righteousness acceptable before God. At Golgotha God's Son, Jesus Christ, saved a people in the ark of His body; Noah covered his ark with pitch (or 'cover') which points the sinner to Christ's blood, shed on the cross as a cover for sin. Not only does that blood wash the believer's sin away but through it the very righteousness of God is imputed to him, held to his account, enabling him - in Christ who suffered for him - to pass through the floods of God's wrath and to stand before God the Father holy and acceptable in Christ Jesus. The global flood that God brought about in judgment in the days of Noah was a calamity for those who ignored the faithful preaching of God's servant. But God showed His grace towards man in saving Noah and his household along with the male and female of every creature which God had made. The troubled days in which we live are no different from Noah's with men living for themselves and their own pleasures and ignoring God and His righteousness. I recommend "Noah and the Flood" to all those who would seek to know the spiritual meaning behind the alarming events recorded in Genesis. May many be given an ear to hear God's warnings about the very real consequences of sin and the need for a Saviour. This new commentary on Hebrews, is part of the "Welwyn Commentary" series and as with the author's other book, "Free in Christ", it is to be recommended. "The epistle to the Hebrews begins by unveiling the glory of Christ - the eternal Son of God who shares the everlasting throne of 'the Majesty on high'. It shows in entrancing detail how he descended from that throne to become a man, that he might rescue his people from death, judgement and the power of sin. How? By inaugurating a new covenant - 'the new covenant in my blood' - replete with better promises, a better priesthood, a better sacrifice and a better hope than had hitherto prevailed under the law of Moses. By one offering for sin for ever, Christ our great High Priest has perfected for ever those he has set apart for his glory and who come to God through him. He is their advocate, their rest, their righteousness, their example, and their 'exceeding great reward'." This simple, easy to read, verse-by-verse commentary on the Gospel of John can be used as part of your daily devotions. Henry Mahan points the reader to the glory of Christ throughout the Gospel, faithfully proclaiming God's free and sovereign grace. This is a boxed set of six easy to read commentaries by Pastor Henry Mahan on the books of the New Testament. Henry Mahan is the pastor of Thirteenth Street Baptist Church, Ashland, Kentucky, where he has faithfully preached the Gospel for over thirty years. We can highly recommend his warm, heart-felt ministry. In the opening words of the first chapter, after quoting Romans 1:1-4, the author states that "The Gospel is concerned exclusively with the Son of God". How true that is. And from that point on John Metcalfe presents the Lord Jesus Christ in His deity, His eternal Sonship and His relation to the Father, and proceeds to show how He "was made" according to the flesh, of the seed of David. Here is a book which really changed me. I can't adequately describe the effect it had on me when I first read it other than to say that it made me see Christ in a way I never had before - how glorious He is. Having read it several times the truths presented still come over with the same power and joy as they first did. As it says on the back cover, this is "Doctrine on Fire". My review can't really do this book justice - highly recommended! "Sermons of Robert Murray M'Cheyne"
Robert Murray M'Cheyne (1813-1843) was a minister powerfully used by God in the preaching of the Gospel, despite being short-lived. He died at the age of 29 having ministered for just seven and a half years but the fruit of that ministry remains today. This short paperback volume contains 26 of Robert Murray M'Cheyne's sermons ranging from "The Love of Christ" (2 Corinthians 5:14) to "The Vessels of Wrath Fitted to Destruction" (Romans 9:22-23). They are all easy to read, but powerful and uplifting, each exalting of Christ. Recommended! John Kershaw (1792-1870) was a minister of the Gospel for over fifty years at Hope Chapel, Rochdale and was a close friend of William Gadsby. He preached from the heart declaring the sovereign grace of God and insisting upon inward experience of the truth. This well-produced hardback edition of sermons is edited by B.A. Ramsbottom and includes a short biography of Kershaw. Among the 20 sermons included are "The Prince of Peace" (Acts 5:31), "Christ's Sheep and Their Marks" (John 10:28), "The Only True Ground of Rejoicing" (Isaiah 29:19) and "Great Things The Lord Has Done" (Psalm 126:3). Zoar Publications is an imprint of Christian Bookshop Ossett from whom the book can be ordered. "True religion is more than notion, something must be known and felt" reads Hart�s hymn. Find out what he means by reading about the spiritual experiences of the remarkable group of people described in this book. This new work by B. A. Ramsbottom is the first full length biography to be written about the 19th century Baptist minister William Gadsby. William Gadsby (1773-1844) was greatly used by God to proclaim the Gospel in his day. One church historian described him as "no less important in his way... than Bunyan." Gadsby ministered in Manchester for 38 years and as well as fearlessly preaching the Gospel against much opposition he also championed the cause of the poor and oppressed in the area. William Gadsby is also remembered for the many hymns he wrote including the well known "Immortal honours". Mr Ramsbottom has produced an excellent account of Gadsby's life and work which not only details the history of this man of God but also gives us much insight into the Gospel he knew and loved and the way in which he always honoured his Saviour, the Lord Jesus Christ, in his sermons. This was a man who walked with God, loved his God, and preached God's Gospel powerfully, always abasing man and exalting Christ the Saviour. The book is beautifully produced, very readable, and highly recommended. In this biography of the 18th century preacher, William Huntington, George Ella shows how, despite his humble upbringing and lack of education, Huntington was used greatly by God for the building up of the Lord's people in the faith. One contributor to the Gospel Magazine wrote, "No one since the apostolic age, I think has so plainly instructed, and so clearly set forth to the church, the manner in which the Lord carries out his work in the souls of his people". I can recommend this book very highly along with the many works which Huntington wrote. The 18th century preacher Augustus Toplady is probably best remembered today for his well known hymn "Rock of Ages". Although his life was short and he was affected by ill-health for most of his adult years Toplady was nevertheless used by the Lord to bring great blessing to God's people as he ministered the Gospel and defended the truths of Sovereign Grace, especially against the opposition and the Arminianism prevalent in his day from such people as John Wesley. George Ella has written another excellent biography which gives us an insight into the life and labours of this man of God, which provides a particular local interest to ourselves as he spent several years ministering in the village of Broadhembury which is but a few miles from Honiton. This large volume (hence the price) also includes an extensive anthology of Toplady's own writings including hymns, essays, biographies and letters. James Bourne (1773-1853) was the gospel minister used of God in the gracious awakening that occurred in the first half of the 19th century at Pulverbach in Shropshire. It was Mr Bourne's custom to conduct family morning readings when he was at home in London. This excellent book collects together a number of these readings, together with several of Bourne's letters, and is suitable for use as a daily devotional book. Very profitable daily readings taken from the works of J.C. Philpot. A further collection of daily readings taken from the works of J.C. Philpot. A collection of daily readings by Pastor Donald S. Fortner, of Grace Baptist Church, Kentucky, U.S.A.
A concordance is a very valuable study aid if you wish to find phrases or word usage throughout the Bible. This hard-back edition of Strong's Concordance is very helpful. It contains the locations of every word used in the Authorised Version of the Bible and points out the underlying Greek and Hebrew words so that you can distinguish between different uses of a word.